The FBI says the man who robbed a Byline Bank near Diversey and Halsted on Tuesday is responsible for two other Chicago bank heists. 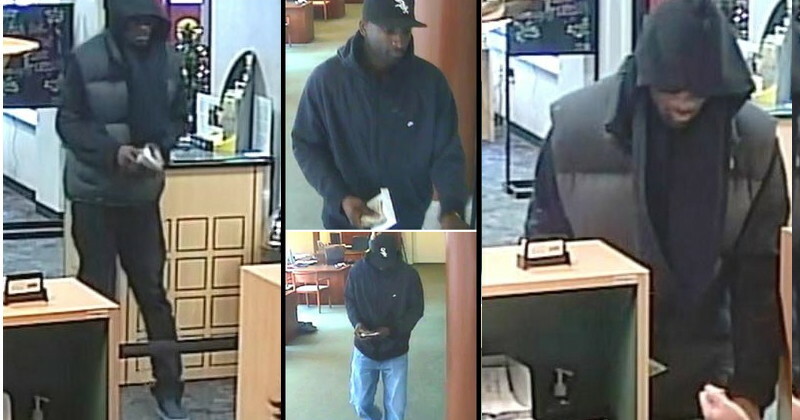 Investigators now say the man also robbed the U.S. Bank at 2131 S. China Place in Chinatown on December 28 and the American Eagle Bank at 2255 N. Western in Bucktown on January 15. He entered the Byline Bank at 742 W. Diversey around 2:30 on Tuesday, passed a note, and walked out with $1,250, police say. Witnesses and officers who reviewed surveillance images describe the offender as a black man standing between 6-feet and 6’2” tall, with a slender to medium build. He wore a black White Sox hat, a dark hoodie, and jeans. He was last seen walking eastbound on Diversey. The FBI is offering a reward for information that leads to the man’s arrest. The bureau may be contacted at 312-421-6700.